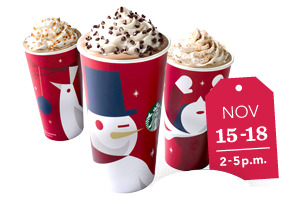 Starbucks Buy One Get One free event is today through Nov 18th! Catch up with a friend over a holiday beverage. When you buy one, they’ll give you a second one of equal or lesser value for free at participating stores (2-5 pm). Find out more from Starbucks here!